Parker began his financial services career in 1995 with Salomon Smith Barney as a Financial Advisor in the New Orleans, LA complex. After 10 years as an Advisor and obtaining his Masters of Business Administration (MBA), he then moved into management with Smith Barney’s Consulting Group (The Consulting Group) as a Regional Sales Director, focusing on Fee-Based practice management and Advisory Solutions. In 2008, he ascended to the National Business Development Directors role with The Consulting Group focused on driving adoption of open architecture and “Rep as Advisor” platforms. 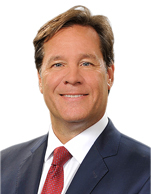 In 2010, following the integration of the Morgan Stanley Smith Barney joint venture, he joined Cushing Asset Management as Senior Managing Director and Head of Business Development to specifically design, build, and launch the Firm’s open-end mutual fund platform and subsequently helped facilitate the strategic partnership now established with NY Life’s Mainstay Funds. He sits on the Executive Committee at Cushing Asset Management, has a BA in Economics from Rollins College, and an MBA from Tulane University’s AB Freeman School of Business. He lives in Dallas, TX and is originally from New Orleans, LA.